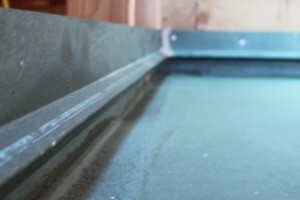 Balcony Waterproofing Level One- What is it? Just what is balcony waterproofing? Balcony waterproofing is actually better described as balcony deck waterproofing. 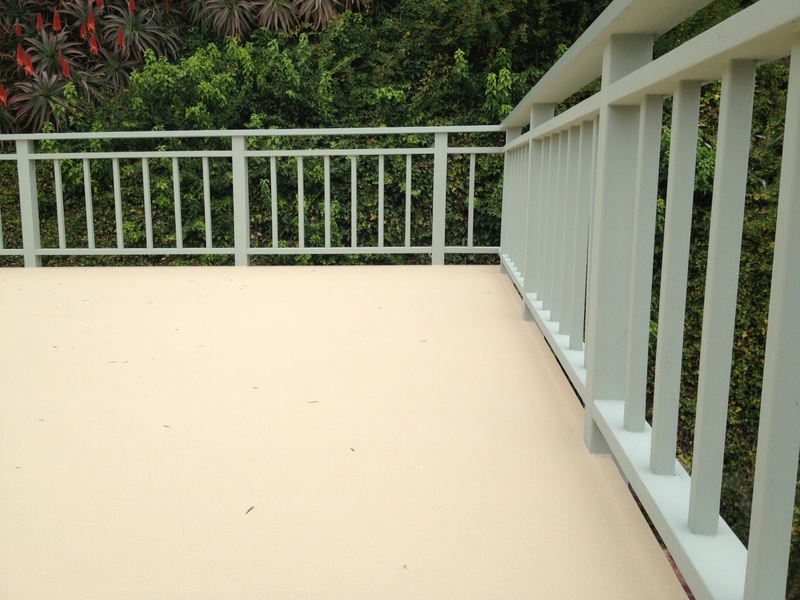 If your balcony deck needs a partial or full waterproof repair and/or resurfacing, give Prestige Deck Coating a call! 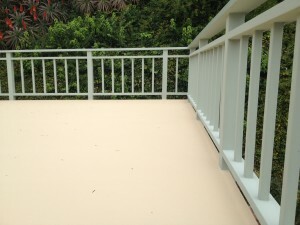 Balcony waterproofing will keep your deck and below dry! Imagine you have a custom home deck on the waterline, partially covered by a descending staircase . Additionally, it has multiple, asymmetrical corners and two types of railing attached on top of the deck, one metal and one wood. This sort of balcony waterproofing challenge is what gets our creative juices flowing! Flashy Flashing. As mentioned in earlier posts, the foundation is key to deck waterproofing. So, this particular sort of deck repair is a double challenge. First, we customize the metal flashing, talking the extra time to ensure each corner is properly bumped up against the corners, making the edges flush. As we continue around the perimeter, we realize we will have to overlap various portions. Tricky decks are just that. We raise a door jamb because we have a wooden fence foundation to take into consideration, as well as a metal railing. Lastly, we meticulously crafted the flashing to mesh perfectly, for an assuredly waterproof foundation. Railing Repair. What about that fence and railing that are adhered to this custom deck? How do you ensure a waterproof seal on your deck when there are holes drilled into it? Great questions. 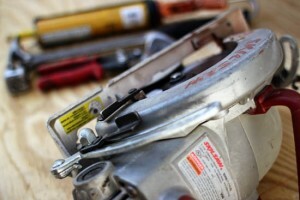 One, the best option is to drill directly into the plywood base level. This allows the 6-level Prestige balcony deck restoration system to waterproof the railing base. Two, if that is not possible, then let Prestige creatively solve your custom deck waterproofing problems with ingenuity and industry-tested methods. Anytime you drill into the surface of a finished custom deck, water will assuredly find its way into any holes. This project is just one example of the many progressive custom deck waterproofing techniques employed at Prestige Balcony Waterproofing Orange County CA. Follow us in the next blog entry as we talk about the next step in the balcony waterproofing process: the deck coating system.